If you want more toned, smooth, wrinkle free skin or if you want to clear acne, eczema, rosacea, psoriasis or just want healthier more vibrant skin. Then do what Mary did. After spending $750.00 on a facial at the most expensive spa in the U.S.Mary gave herself this home facial and guess what? She got better results with our home facial. Her skin became clearer, smoother, brighter, tighter, and healthier. She used three of our most popular products for her home facial: Nature’s Transdermal Face Food™, Mystique™, and our Clay Cleansing Bar. Like the rest of the Nature's Skin and Body Food product line, the home facial products are organic and completely non-toxic. I could go on and on about the science behind why these products are so effective at clearing, healing, and anti-aging your skin; but if you are like me, you like things simple. In Nature there is a miracle molecule cluster called fulvic acid that completely dissolves in water. Sick, dead, or broken down cells are attracted to fulvic acid mineral clusters like iron is to a magnet.When cells come into contact with this miracle substance they become healthy, alive, and well. The minerals present in the fulvic acid complex we extract from our clay and use in our products are as necessary to the health of your cells as the oxygen you breathe. In specific areas around the world where people live lifespans beyond a hundred years there is a connection between fulvic acid mineral complexes in their soil and their longevity. For instance, there is an area in Japan where the population lives to an average age of 110. They retain smooth, youthful skin even past the age of 100 and what is really astounding is that most are heavy smokers. How is this possible? Because this population receives lots of fulvic acid mineral clusters in their food and environment. Fulvic acid can neutralize toxins better than any natural substance science has yet discovered, including toxic pesticides and radiation. - It serves as a powerful electrolyte to restore the electrical potential in cells which in turn helps bring an attractive glow to the skin. - Neutralizes all forms of free radicals better than any vitamin or herb and helps you to get rid of age spots or restore the structural integrity of your skin - giving you tighter and more toned skin. - Possesses an inherent ability to neutralize harmful bacteria, viruses, and fungi which can really help to clear up problem skin like acne, rosacea, eczema, and even psoriasis. - Delivers a mineral cluster in a small enough size to be utilized by cells to produce more new collagen and elastin fibers, thus giving you a more youthful look. - Helps your cells create new skin faster, thereby increasing cellular turnover so that your skin always has that fresh, radiant look to it. The main component of this clay mask is a rich montmorillonite clay teeming with fulvic acid mineral clusters that infuse your skin with massive amounts of nutrients; we also add over 30 herbal extracts to insure that these minerals penetrate deep into the skin. This formula also pulls out toxins like metals, dead skin, chemicals, and accumulated debris. No synthetic chemicals are used in this clay mask. It is the only clay mask we know of that does not contain some sort of chemical preservative. You can do what we did and compare ours to theirs and you’ll find our statement to be true. We start with massive amounts of our special clay and extract all the fulvic acid mineral clusters that are infused into an organic cream base that has high concentrations of Frankencense and Kigelia. This is the most moisturizing, healing face cream that has ever been developed. The effects go way beyond even the most expensive creams sold around the world today. Your skin will be smooth, soft, toned, tightened, and glowing. Over 5lbs of our clay is used to make each 1.7 oz jar of this cream. 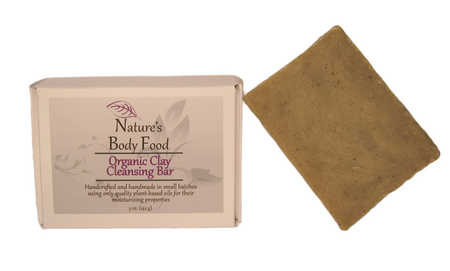 We took virtually every ingredient in our clay mask and made an organic clay cleansing bar. This high-lathering cleansing bar is so moisturizing that you can shave with it. It naturally deodorizes to your skin and deeply cleans in a profound way. Cleanse your face night and morning with the luxury clay cleansing bar. Afterwards, apply a thin to moderate layber of Mystique™ to your face and neck including around the eye and behind the ears and neck. 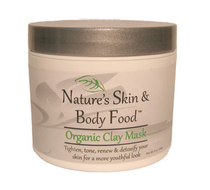 Every other day, apply our clay mask Nature’s Transdermal Face Food™ to your face and neck. Allow to dry (usually around 10 or 15 minutes), then wash off in the shower or bath or with a warm towel at the sink. We leave a little grit in the clay to help with exfoliation, so when you are washing the mask off be careful not to use too much force. 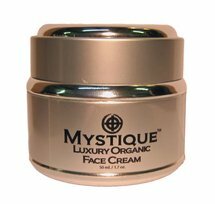 Always apply the moisturizer Mystique™ after using the clay mask. We recommend while you are using these three products that you avoid the use of any other product containing toxic chemicals -- particularly avoid toxic products for up to 24 hours after application of the clay mask (with the exception of some foundation or light makeup and mascara). Most face moisturizers and eye creams, even the really expensive ones, contain toxic chemicals. 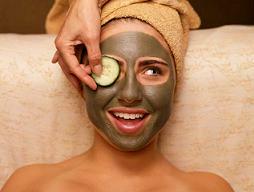 You are using our clay mask to get this toxic junk out of your skin - so don’t keep adding it back into the skin. As your skin improves, you willl have the option to choose to wear much less makeup or none at all; and you really won't need any other skin care products. But we are going to give you one extra cleansing bar free ($9.00 retail price). We're also going to give you one bottle of our luxury organic body lotion that is so moisturizing some people only use it every other day. It's also the best lotion for your feet and hands ($19.00 retail price). Your total savings on the purchase of these three products in the home facial kit is $40.50. And, if for any reason you are not satisfied with the results these three products used together have on your skin then send them back to us for a full refund, and you can keep using your free products. That's how confident we are that you'll be impressed by how this kit truly does impact the look,feel, health, and vitality of your skin. So go ahead and order these home facial products right now, and a few days from now your skin will love you for it.